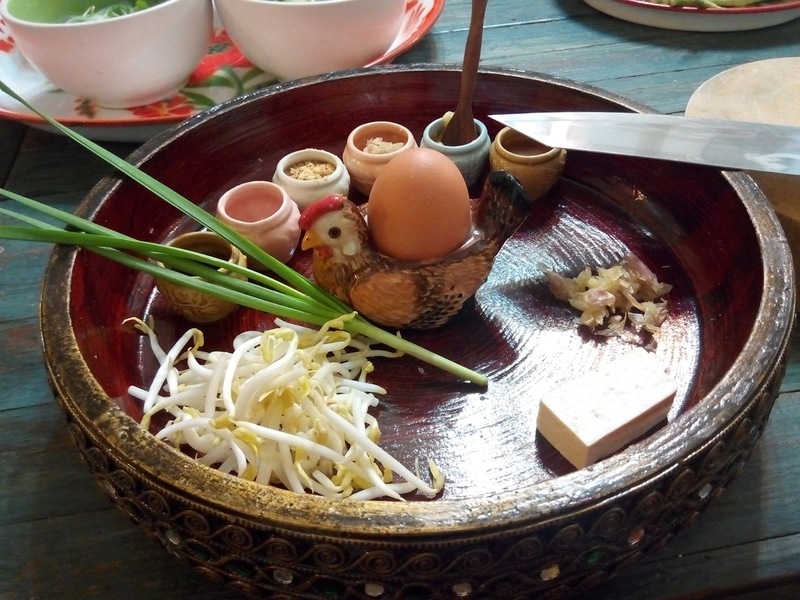 Since we started planning our trip to Southeast Asia, one thing high on my own priority list has been food. I’ve been trying new foods and learning as much as I can on a limited schedule and budget. 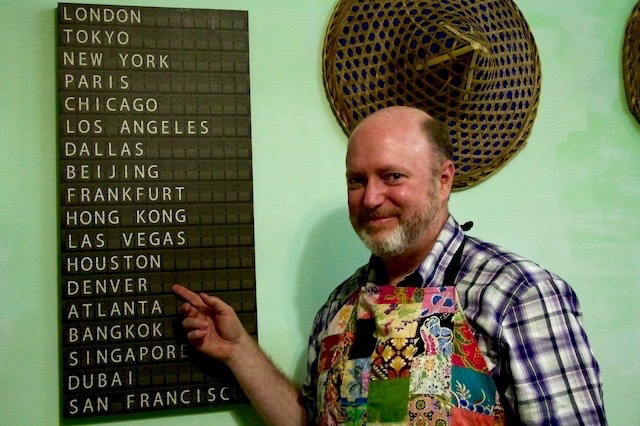 I knew I wanted to take a cooking class in Thailand and in India, and maybe one in Cambodia. So the day after we arrived in Bangkok, I started looking into classes. 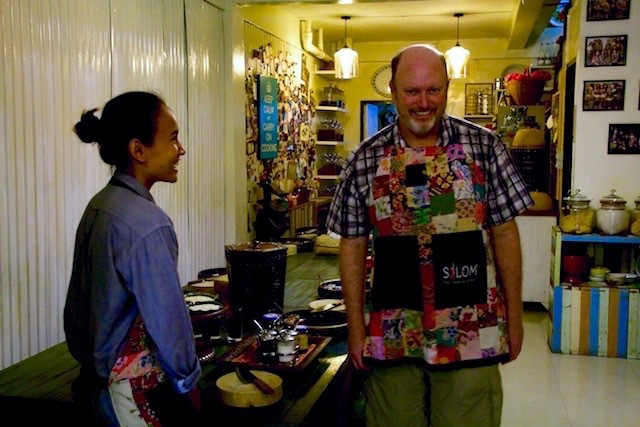 I settled on Silom Thai Cooking School. It’s near the hotel where we’re staying, the Pas Cher Hôtel de Bangkok. And it gets really good reviews online, plus their website made the whole thing sound like great fun. A half day class is 1000 baht. That’s a huge amount of money in a city where an hour long massage is 200, and a plate of pad thai is 40. But it was worth it. 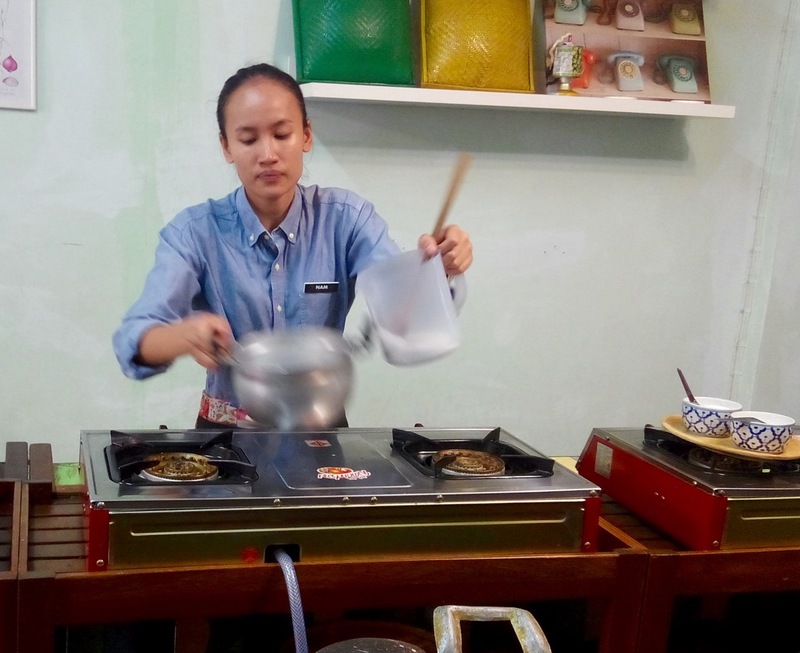 Especially once I found that the school is air conditioned and that in addition to our instructor there were two other helpers doing all the legwork in the kitchen — cleaning up after each dish we made, prepping the next thing, etc. The class is taught in English. Ironically, Beth and I were the only native English speakers in the group. The instructor was Thai, one student was Japanese, and the other six were all from Taiwan. The meeting point for the start of the class was inside one of the BTS Sky Train stations. That’s Bangkok’s elevated light rail system, separate from their bus system, their bus rapid transit system, their subway system, and their river express boats. Yes, they have a lot of modes of public transit here, and that doesn’t count automobile taxis, motorcycle taxis, and tuktuks. Anyhow, getting to the meeting point was the hardest part of the whole class. We went to the BTS station near our hotel, bought our tickets, and then went to the platform. But because we were traveling in rush hour, all the trains inbound to the city center were already packed. We (and hundreds of other commuters) had to let the first two trains go past because they couldn’t squeeze any more people on board. Finally, we got on the third train, went only two stops, and then got off at the station where we were to meet the group. Of course Murphy’s Law states that if you get on a jam packed train on the right side, the station where you get off will have the platform on the left. But Beth and I muscled our way to the door, got off the train, and soon found the meeting point. As other students arrived, we introduced ourselves and had some idle chit chat. Once the main instructor arrived, she said that because of the number of students we would be splitting into two groups. So they read off names for the first group, which included us, and we all went with a different instructor, named Nam. Guess what the first step of the tour was? Nam handed out pre-paid BTS tickets, and we got right back on a train headed the other direction, went two stops, and got off at the same station where we started! 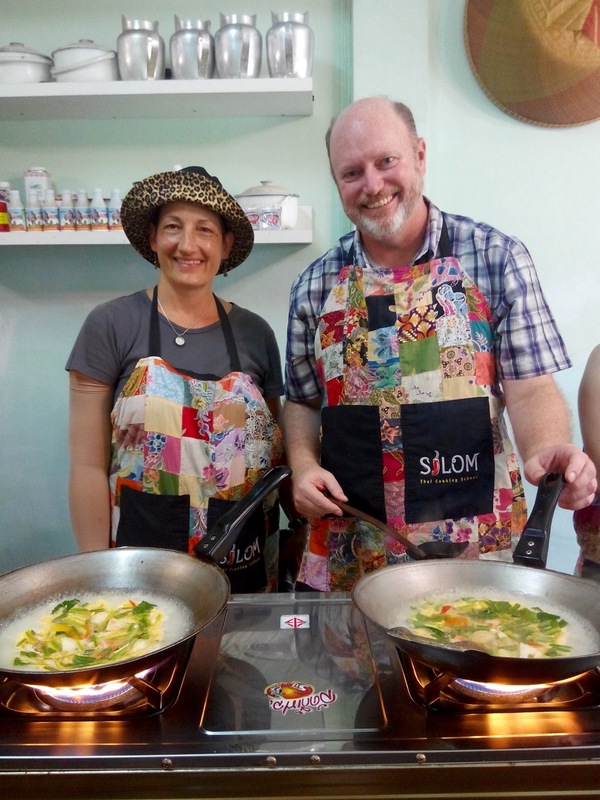 In fact, we soon learned, both the market and the cooking school are very near our hotel. If we’d known all that, we could’ve just walked to the market to meet up with the group in about five or ten minutes and saved about an hour of commuting hassle and two train fares. Oh well. We proceeded into the narrow alleys of the fresh market as a group. 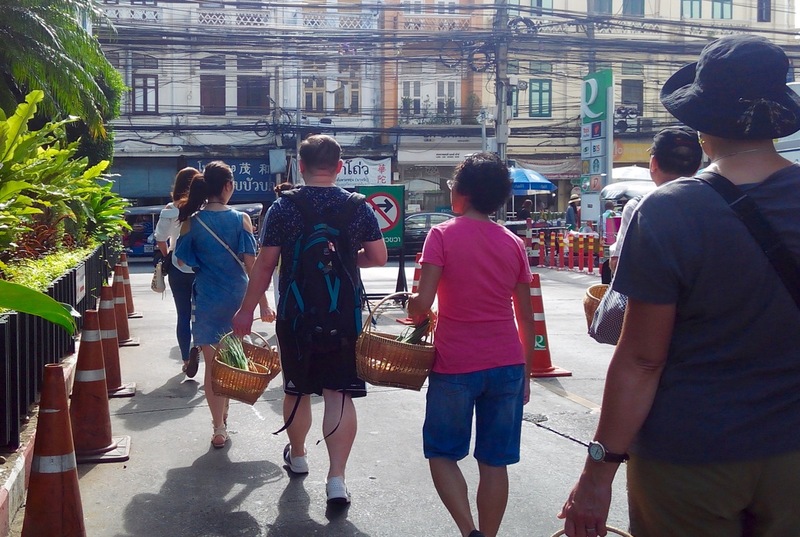 At the first stop, we got shopping baskets for everyone in the group, and then went to the coconut seller. We saw the coconut shredding machines, and learned about the two types of coconut “meat” — one that’s pure white and one that’s speckled grey because it contains some of the skin (not the shell). Nam said we could also buy coconut milk and coconut cream here, but that we would be making our own from scratch instead. Then we continued to the seafood shop, where she taught us how to tell fresh shrimp from shrimp that are too old. They have shrimp from the river and shrimp from the sea there. But we didn’t actually buy any of them, because her helpers had already been to the market earlier to buy enough for all the dishes we needed. I didn’t realize it at the time, but they were cleaning and shelling them for us back at the cooking school. Next up, we bought herbs and vegetables. I’m not sure I remember everything we got, but I know we picked up lemon grass, finger ginger, galangal, cilantro, something she called Thai cilantro but which I think is the thing we usually call culantro, pandanas leaves, kaffir limes, kaffir lime leaves, baby garlic, coriander roots, green onions, chives, little eggplants (they looked like tomatillos to me, and are very different than aubergines, the big purple eggplant we see in the US usually), sweet basil, tamarind paste, long beans, and both green and red chiles. We learned there are two types of tamarind, a sweet and a sour; the sweet is sold with the skin on to differentiate it from the sour which is sold without the skin. We got to sample and smell all the herbs, which made me smile. Then we headed back to the cooking school, where we put our stuff away, got aprons, drank some cold water, and washed up. 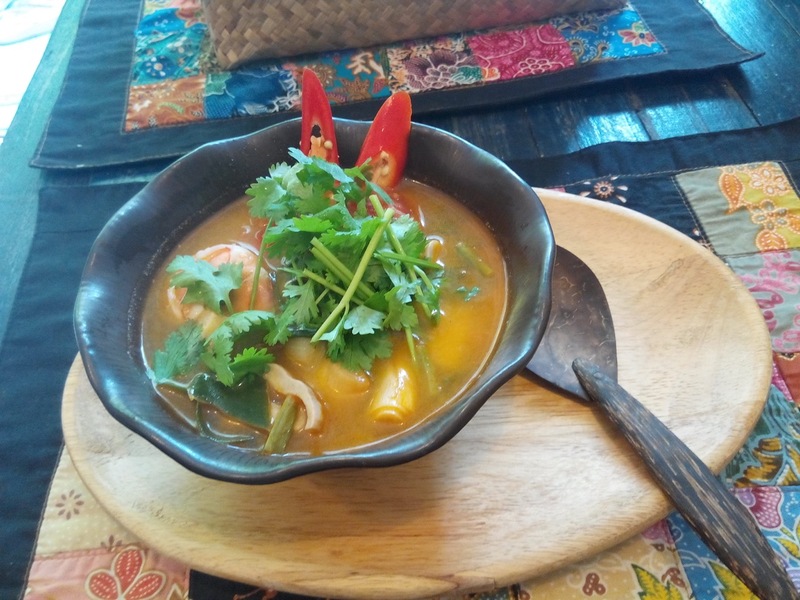 The first dish we made was tom yum goong, which is the Thai hot and sour soup with shrimp that you see at every Thai restaurant in the US. I’ve made it before by carefully following a recipe, and it took hours, plus some herbs that are hard to find in Broomfield, kaffir lime leaves vexing me to no end. But this recipe was actually quite fast to cook. Prepping the ingredients takes a while, but making the soup just takes a few minutes, not hours. And the result tasted a lot better than the big pot I made years ago. Mine was a bit spicy. I put two red birds eye chiles in, plus chili paste, and then it was garnished with more red birds eye chile at the end. The student from Japan could barely choke hers down, even though she only used a half a chile compared to the two I used. I guess she’s not used to spicy food. 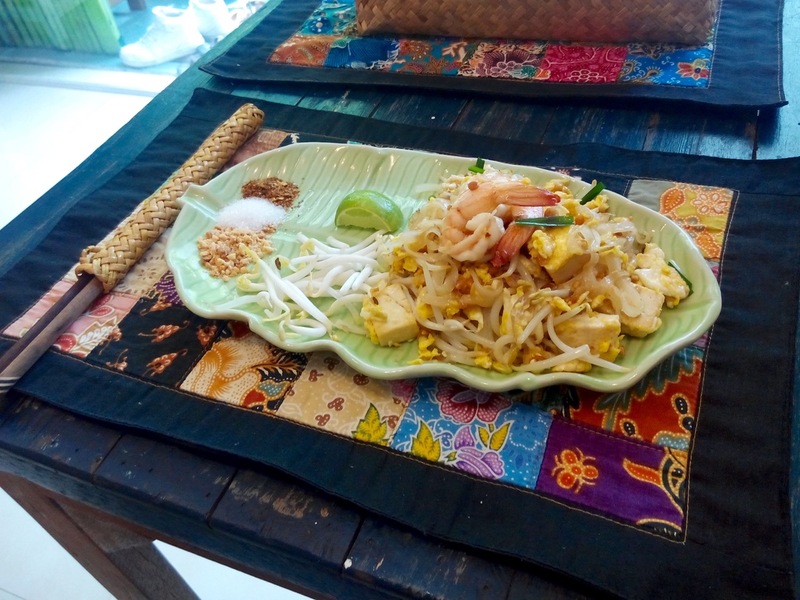 Once we finished our soup, and I finished sweating because of my soup, it was time to prep ingredients for the second dish, pad thai with shrimp. The helpers prepped all the shrimp, which was awesome. So all we had to do was cut up some chives and tofu. We made the dish with fresh noodles, so there was no need to pre-soak them for a long time; just five minutes in cold water before cooking. The result looked good and tasted fine, but it could’ve been better. I added extra peanuts and ground red chile on top at the end, but I think it needed more fish sauce, frankly. Still, it was filling, especially since we ate it around 10:30. 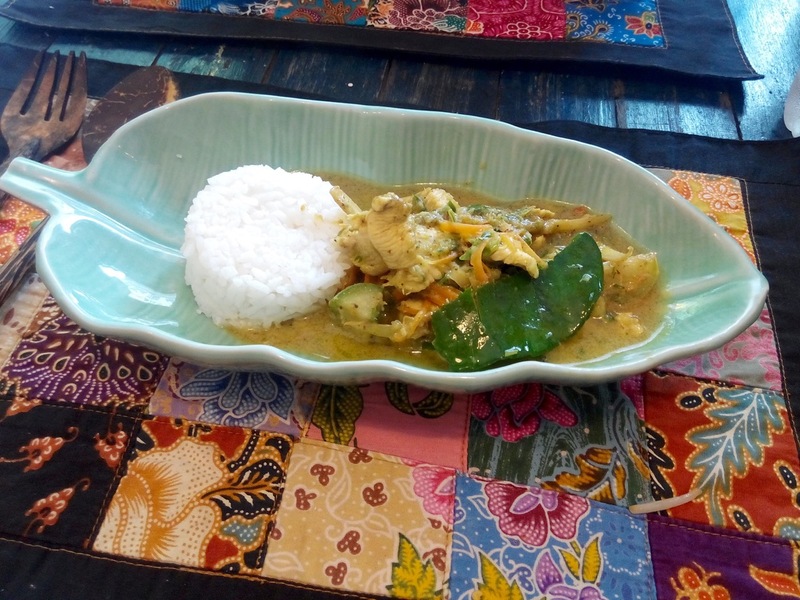 Next, it was time to make phanaeng curry with chicken. This one didn’t take too much work, either. It was just chicken and long beans and the curry. I wasn’t too impressed with this one. My curry separated into oil and the sauce. I felt like I must have done something wrong, but the instructor said that at home you should just make this without the oil. The coconut cream provides the fat to cook everything in. We just used oil because we were sticking with the school’s official recipe, but that’s not how she makes it. It tasted fine, but didn’t look nice, so I didn’t bother taking a photo to share with you. Moving right along, we then started on green curry. This one took a bit longer because it was our chance to make curry paste from scratch. 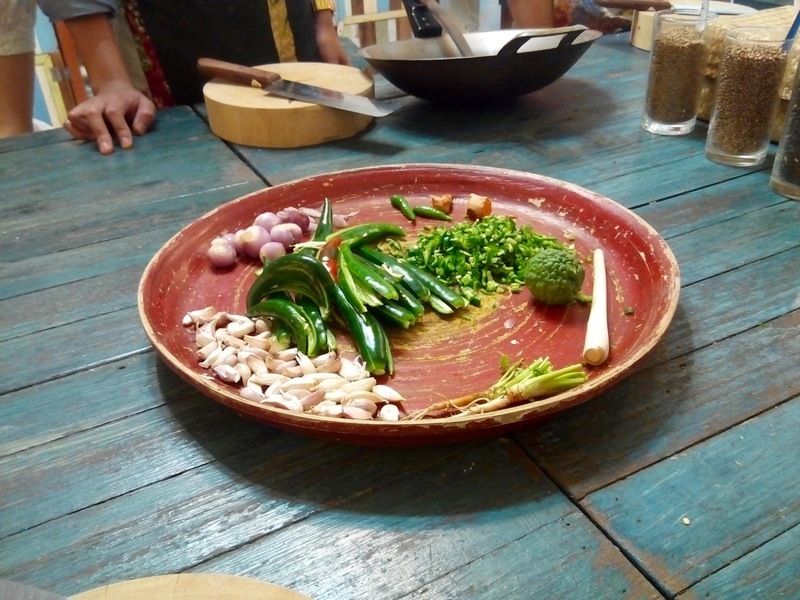 In short, the students all chopped up the stuff in this photo into tiny pieces, while one student toasted some of the dry seeds you see on the left — coriander seeds, black peppercorns, and cumin seeds. 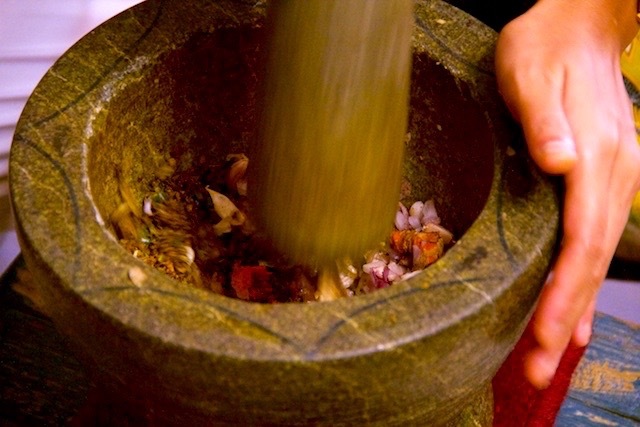 Then Nam showed us how to grind everything together using this big mortar and pestle. She said you can use a food processor at home, but we’re doing it the old fashioned way for class. She pounded the dry ingredients, then added some of the fresh ingredients, and then let each student have a hand at grinding, one by one. 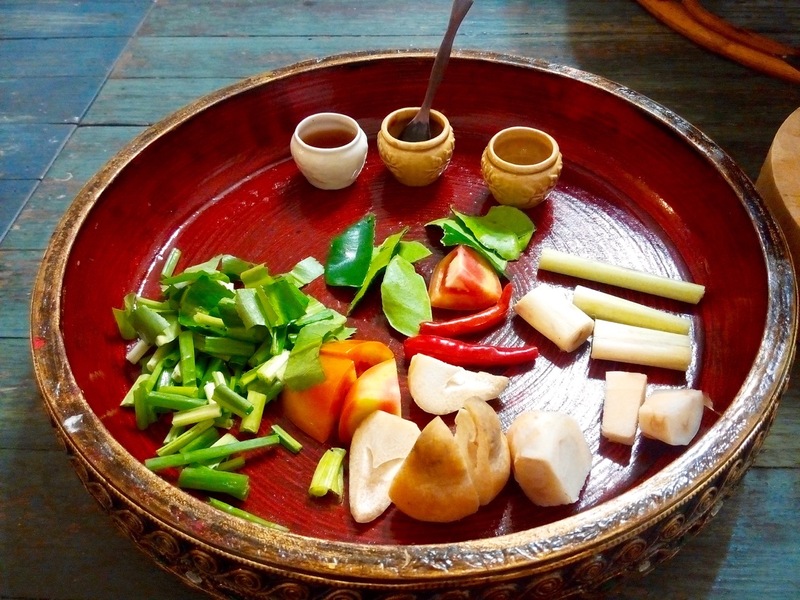 In the end, we had a big pile of green curry paste. 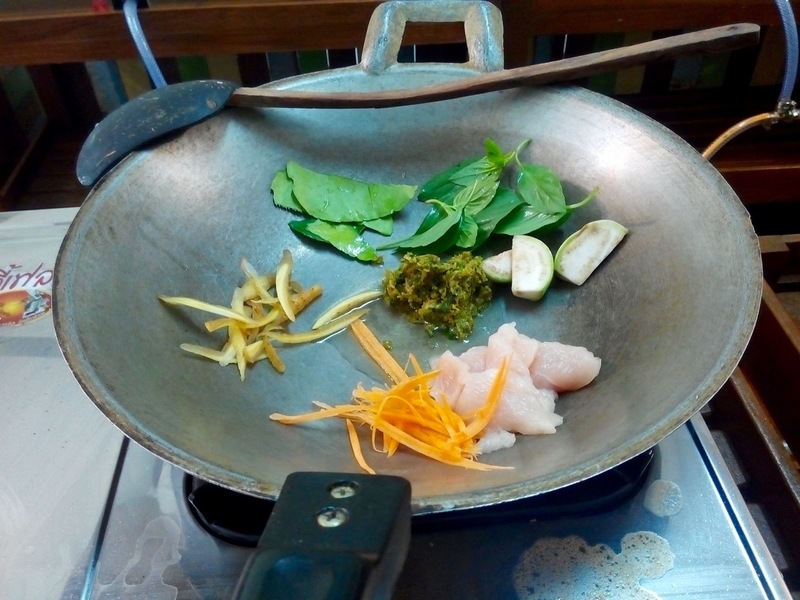 The paste went into the pan with soybean oil, eggplant, shredded carrot, kaffir lime leaves, sweet basil, shredded finger ginger, and chicken. 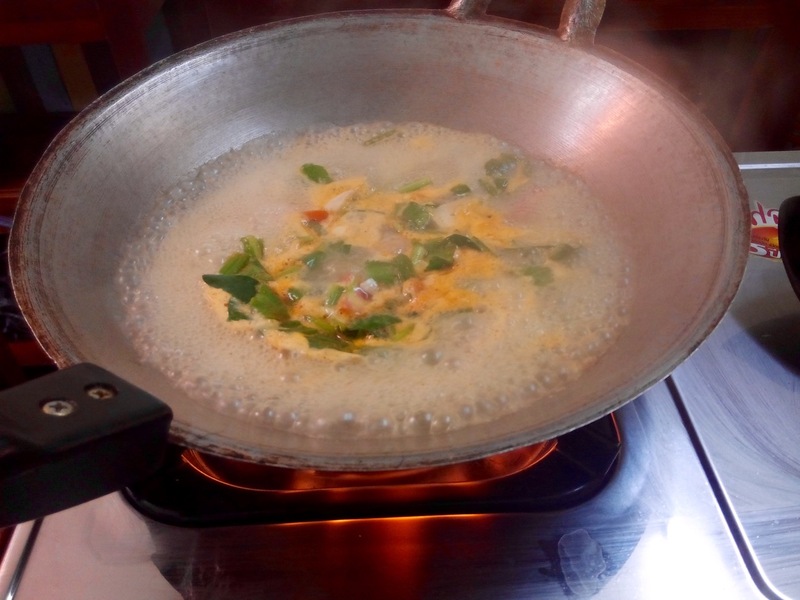 And then as you are stir flying this stuff, you add the coconut cream and then coconut milk. This one came out better than the previous curry. Here’s a photo of how mine looked, with some rice. 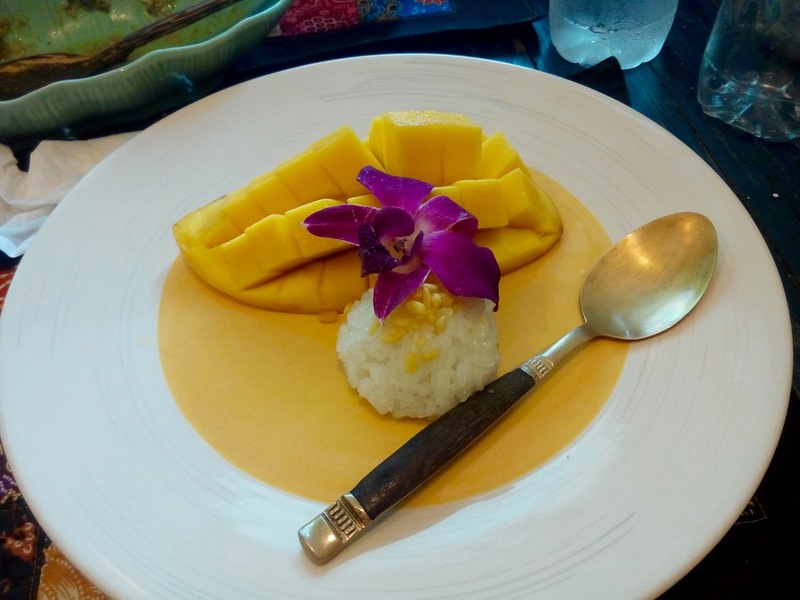 The final course was mango with sticky rice. It was delicious, and I’m including a photo. But the students really didn’t have anything to do with this. The instructor’s helpers prepped the mangoes, steamed the rice, fried the mung beans, etc. Note: It may look like there’s some sauce on this plate under the mango and rice, but that’s just where the plate has a different color. Several of us students made the mistake of thinking the plate design was actually some sort of cream, but it’s just an optical illusion. And then class was over. We each got a little recipe book to take home. The Japanese student got a special one in Japanese to go with her copy in English. Strangely, the six Taiwanese students didn’t get any special book. I guess they figure if you speak Chinese you can read English just fine, but Japanese people can’t? It doesn’t make sense to me, but whatever. We all cleaned up, paid our 1000 baht, and said our farewells. Once we got back to the hotel, Beth and I both needed a nap. It’s hard work cooking and eating all day!